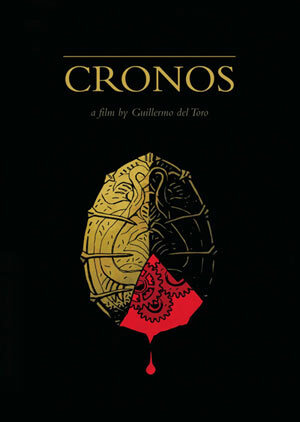 "Cronos" is a film that starts out promising, then kills itself dead much to the horror of the viewer. Director Guillermo Del Toro is one of today's most impressive filmmakers, but even he couldn't resuscitate this dud after a certain point. Initially, we are given an interesting premise: pleasant, aging antiques dealer Jesus (Frederico Luppi, who would later go on to play in Del Toro's great "Pan's Labyrinth" and "The Devil's Backbone") comes upon a a strange discovery hidden within a statue of an angel in his shop. This discovery, as it so happens, is a golden scarab tucked away with the hopes, presumably, of never, ever, being found. 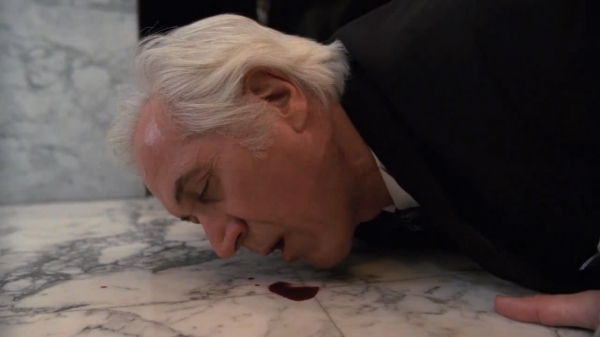 Meanwhile, loutish thug Angel (Ron Perlman) is looking for the scarab, which in turn, is doing strange things to Jesus. The scarab contains the secret to eternal life, wherein lies the big question: would you like to live forever, regardless of the consequences? To watch history unfold, but to see your children, your grandchildren age and die before your very eyes? Unfortunately, the film trades pathos for kitsch and camp. At times it displays the worst qualities of American cinema: stupidity, coarseness, and crisis of tone. Also, child actor Tamara Sharath plays the completely unbelievable character of Jesus' granddaughter, Aurora. I mean, this girl is a trooper. She deals with mutilation, injury, a beloved family member coming back as one of the undead with nary a sniffle, let alone a tear. Are we supposed to believe that little girls behave this way, even brave little girls? What's more surprising to me than Guillermo Del Toro's name on the film is the fact that it was released on Criterion Collection, distinguished as "important contemporary and classic" films from around the world. This is not even a particularly good film, let alone a important or classic one, so crowning it as such boggles the recesses of my mind. Please, don't let this review stop you from seeing Del Toro's later films. I am in the minority in that I actually like his spooky ghost story, "The Devil's Backbone," better than the Oscar winning "Pan's Labyrinth." This is, to be fair, Del Toro's first feature-length film. Remember when you couldn't draw very well? (Maybe you still can't draw very well, but I digress.) Maybe you drew stick figures, and your mother hung them from the kitchen wall like you were a virtual Van Gogh. Well, this is Guillermo Del Toro's stick figure to his later Auguste Renoirs, and a reminder that the best of us were amateurs at one time. I'm glad someone else found this movie to be dull. I honestly couldn't even finish the movie. I shut it off after a good 15 minutes. Thought about seeing it again especially when Criterion released their version, but after readin your review I will wait. I never saw this one, but it sounds...odd. I liked some of Del Toro's movies but most of the time he is very hit-and-miss for me. I was curious to check out this one but now I'm not sure. Pan's Labyrinth intriguing but in the end it's way to violent for my taste. I did enjoy Pac Rim immensely though, more than I ever thought I would! Great review! I haven't seen this or The Devil's Backbone, but I'd like to give them a look. Del Toro can be hit or miss for me, though. I love Pan's Labyrinth, but the Hellboy films and Blade II aren't his finest hour. Hopefully, Pacific Rim is better than some of his recent work.